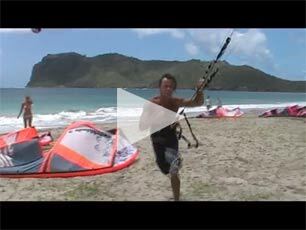 The St Lucia Kitesurfing Fiesta is an event for kitesurfers of all levels - if you've never taken part in a competition before then this is a great way to get started. The aim is to make the most of the great conditions whilst having as much fun as possible. Enjoy the Kitesurfing Fiesta launch party, skipper's meeting, dinner, live bands, beach events, food stalls ... and lots more! It's all about making new friends, having a great time and being a part of genuine St Lucian beach culture. Lots of prizes to be won thanks to our generous sponsors. But with both pro and amateur events, it's not just about winning - it's also about taking part. Register online to reserve your place in the next St Lucia Kitesurfing Fiesta at Sandy Beach, Vieux Fort.